Deadeyes and Safety First, painting. Photo by Connor Rowe. The Theoretical Archaeology Group meeting at UC Berkeley this past weekend assured that I would be screamingly busy. I was an organizer of the conference, participated in a photo session (which I will discuss in a subsequent post), read my friend Shanti’s paper, and organized a session on Graffiti and the Archaeology of the Contemporary. The session faced issues from the start–a lot of people sent abstracts but ended up canceling, I was so busy with the Blogging and Archaeology session at the SAA that I neglected some finer points of organization, and I almost canceled the whole thing more than once. It was good that I didn’t. There were four fantastic papers presented by people from four different places–England, Ireland, Australia, and the US. The papers were diverse in their content, but all grappled with the place of graffiti in archaeological research and in wider cultural heritage. The international scope of the research was impressive and the authors of the papers were obviously intensely engaged in the interpretation of graffiti. A traditional discussion session after the papers would have been lively, fun, and satisfying–you can tell by the abstracts that we were doing something right. But we did something different. 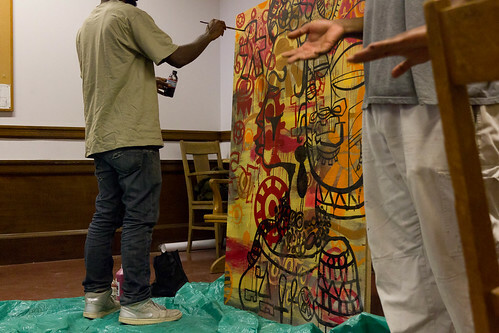 Two members of the Black Diamonds Shining Collective, Deadeyes and Safety First came up from Oakland to conduct a live painting session and discussion of the papers. I had given them the choice, they could just talk or just paint or do a mixture of both. The session was a bit chaotic and ran over time, but at the end of the last presentation, we cleared a big space in front and brought in the large, prepared scrap of wood that I salvaged from Berkeley’s art practice department (thanks, Nick!). Deadeyes and Safety First started painting and the room was absolutely silent. 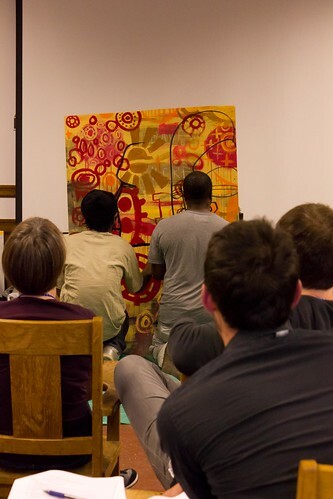 Multinationalism aside, everyone in the room was academic & white, while the graffiti artists were black. Were they just performing? Was it a strange, silent, live, Othering-event? Afterwards, several people confessed their enormous discomfort at this intense scopophilic moment. The presumed silence of our research subject was made real, highlighting the epistemic injustice that underlies academic research. Deadeyes and Safety First. Their faces have been intentionally omitted. Photo by Connor Rowe. Deadeyes capped his pen, stood up and turned around. He spoke, outlining his decade-long interest in and documentation of Oakland graffiti art and the intensely personal and political nature of graffiti, emphasizing the sociality in their chosen form of expression. Suddenly, the focus of the room shifted, and these academic archaeologists had the creator of their studied object pushing back, correcting assumptions, and throwing into question the entire enterprise. Safety First chimed in at times while still working on the painting. I came away from the session humbled but also re-energized. This, to me, more than studying the ruins of theme parks or dismantling vans, was the archaeology of the contemporary. Having graffiti artists live-paint their reaction to the papers was dangerous–I actually had no idea how dangerous until I was in the room, watching the collision of these spheres. It was endangering our precious research, our preferred notions of how material culture was made, and how conferences should be run. I still haven’t fully digested the whole experience, and I’ll be following up with the individual session participants and discussants. Changing archaeological conferences is hard, and risky, and most people resist, probably with good reason. That’s why we still sit in rooms, reading page after page, flicking through powerpoints. It’s comfortable. It’s safe. I was deeply relieved to read a paper in such a session the very next day. Tomorrow I’ll write about another risky and rewarding session I was in, Heather Law’s Opening Dialogs in Archaeological Photography. This was a brave and interesting session. Cudos to the lot of you. I have a question regarding another aspect. I realise you work in an American tradition where archaeology and anthropology intertwine profoundly. However, I wonder if you could explain to me how come this study of contemporary material culture is classified as archaeology rather than as anthropology? Is it because you wish to say something about the past based on the present? And how come there is so little direct interaction with the artists? I ask partly becuase I think Anthropologists in Europe would probably be very critical of a study of contemporary culture that does not include the subjects own opinion of and reaction to that research. I’m very very happy that the artists participated in the way they did. There’s always that unspoken discomfort about representation, and it was most excellent to see them speak for themselves and listen to their philosophy as presented by them. Dead Eyes was a brilliant speaker. Sometimes we need to be taken out of that sphere of safety and papers and see the thing that’s really happening as it happens. The change was refreshing. If they managed to make a whole room of people uncomfortable simply by painting, without the painting even being too terrifying as far as I can tell, then it’s not just you who were doing something right, so were they; surely that’s an opportunity no artist could pass up. Brilliant stroke. I’m intrigued by your visceral reaction. What do you see as the dangers here? I am conscious that, in the medieval conferences I go to, when someone gets up to talk about actually making stuff (or still more, wearing it or using it at reenactment or similar events) there is a certain discomfort in the room among some scholars, who don’t really seem to feel that this is scholarship. (I tend to get round this by calling what I want to use `experimental archaeology‘…) My cynical feeling is that, especially when it comes to objects and their use, the people who don’t play with replicas are at heart afraid that the amateurs (many of whom are, of course, professionals) may know something the scholars don’t, so the biggest danger is perhaps being shown up. Also lurking in there is perhaps the idea that if these people have a useful contribution our degrees are devalued, which is rubbish but understandable perhaps. But what we don’t get, of course, is our subjects of study talking back and saying “you have it all wrong, the helmet didn’t even look like that and we just bunged it in there for a joke anyway” or similar. Is that what you were afraid of, and is that what happened? But then, I would expect the discomfort in the talking part, not the painting… Please, tell us more! This is great stuff, I really wish I could have attended that. I did a (undergraduate) research project on graffiti and street artists in Atlanta this past semester. I was able to present on an on campus event for original research, it was well received and I hope to present it again at another local event. Let me know if you would be interested in reading it, I can send you the abstract at least. Also I’d love to read the papers presented here, if thats possible.